Shares in Sir Richard Branson's Virgin Mobile business have made a steady start to trading on the stock exchange. The shares debuted at 200 pence - the bottom of its proposed 200-220p price range - and stood at 202p by 1330 GMT, valuing the firm at about £500m ($928m). On Monday, Virgin Mobile's advisers had slashed the proposed share price by 20% to win over reluctant investors. Sir Richard said he was "happy" the float had gone ahead given the problems other flotations have had this year. On Tuesday, Premier Foods floated its shares on the London market - although it also had to slash its offer price to attract investors. Other firms have abandoned their flotation plans in the face of tough market conditions. Before Virgin cut its offer price, some analysts had expressed concerns that its shares looked expensive against other mobile firms such as Vodafone and MMO2. Wednesday's float marks Sir Richard's first return to London's stock market since he de-listed Virgin Group in 1988. Originally the flotation planned to raise up to £279m from selling up to 43% of the group. However, the listing will now raise only £125m from the sale of a 25% stake, although the firm says it might sell up to 27.5% if there is sufficient demand. The money will be "retained for further investment in new Virgin ventures throughout the world, with a major emphasis on the United States (where the dollar is weak), China and Africa," said Sir Richard - who is Virgin Mobile's honorary president. 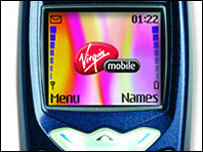 Virgin Mobile was launched in 1999 and operates as a "virtual operator" by using T-Mobile's network. It now has about 4.1 million customers and employs 1,400 staff in the UK.